Also known as dental laminates, veneers are thin facades of your teeth which are cemented on the front surfaces to restore or improve the appearance of your smile. Chipped Teeth. Chips could ruin the aesthetics of your smile, but a broken tooth could be concealed with a dental veneer. Fractured Teeth. Deep cracks and fractures on your teeth could lead to dental sensitivity wherein outside trigger could cause nerves to hyper respond. Once the tooth has been sealed off using composite material, the tooth can look cleaner with the adhesion of the dental veneer. Worn Enamel. Enamel erosion, due to excessive acidic or sugar exposure, can lead to dental hypersensitivity because of the open influx of substances. When the enamel has become stripped away significantly, the necessity to have a veneer placed on increases in order to provide protection to the tooth. Porcelain Veneers. The most durable of the two types of veneers, porcelain veneers can last anywhere from five to ten years depending on how well you are able to care for them. Another advantage of porcelain laminates is the fact that they look more like natural enamel because of their translucent properties. Lastly, porcelain is a stain-resistant compound which means that the beauty of your laminates will last pretty much last longer. Aside from the cost however, other drawbacks of porcelain veneers is that they require two visits to the dentist before they can be cemented into place. This is because porcelain veneers need to be fabricated in a laboratory. Composite Veneers. Also known as direct veneers, composite veneers are made by applying composite resin material right on the tooth and then molding the material to improve the appearance of the tooth. While more affordable that porcelain veneers, composite veneers can chip in just one or two years, and they also take up stain. Lastly, you need to have a dentist with the skill and precision to sculpt the material properly. CEREC® Veneers. 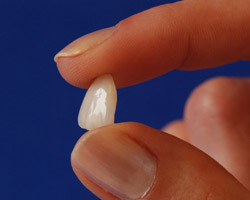 Also known as one-visit veneers, CEREC® veneers are made using a machine which takes digital images of your teeth, turns them into 3D models, allowing your dentist to create models of your restorations and then transmitting the information to the milling device for the restoration to be created in just a matter of minutes.